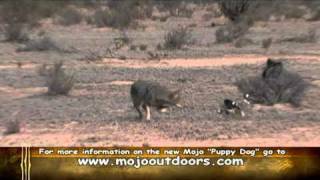 MOJO® brings you a new concept in predator hunting with the all new MOJO® Puppy Dog which is a realistic looking, sounding, feeling, stand alone decoy that is all that you need for predator calling. Emits actual canine puppy sounds and tail moves with the same tantalizing intermittent action as our Critter Decoy, which is the most popular predator decoy on the market. Operates for hours on 4 AA batteries (not included). Punch the button – throw it on the ground – HUNT!